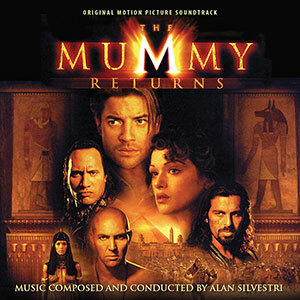 For Universal Studios' sequel to The Mummy, composer Alan Silvestri took the reigns and composed one of the largest epic scores of his career. He describes the score for The Mummy Returns as "Errol Flynn" – a score filled with swashbuckle, honor, adventure, damsels, just like an old pirate movie. The score features a snarling brass idea for the bad guys, a mystery motif on English horn for the Scorpion King, and a general sense of Egyptian mystique and ancient secrecy. Silvestri carries this exoticism into his love theme for Rick and Evy, a romantic melody that suggestively sizzles with the desert adventures and sexual chemistry. All this performed by a 100-piece orchestra and 60-voice choir.